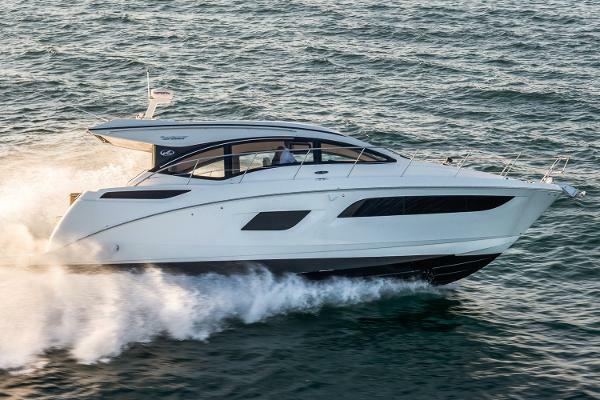 2017 Sea Ray 400 Sundancer Entertainment comes naturally on the Sundancer 400, with an open floorplan that creates generous, interconnected social zones throughout the boat. Large windows and a convenient sunroof, part of Sea Ray's SkyFlow Design philosophy, let in an abundance of natural light. Rich materials and finishes enhance aesthetics as well as comfort, while two full-beam staterooms invite you and your guests to relax, settle in and savor the full experience of life on the water. 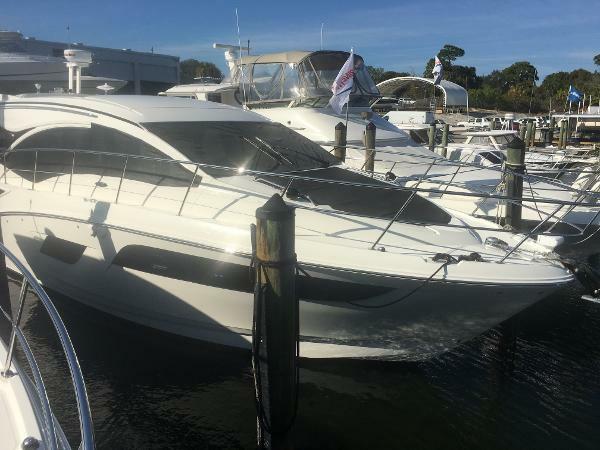 2017 Sea Ray Sport 400 Sundancer 2017 Sea Ray 400 Sundancer, Black hull, Black canvas, TVD QSB 6.7 480 T3 Non DTS Diesels, 120/240 Vac/60 cycle electrical system, Prestige cherry interior, LG genova solid surface countertops, Cockpit and platform teak flooring, Interior carpet runners, Opening portlights in every stateroom, Salon sofa with pull out bed, Second head in V-Berth, Aft stateroom storage cabinet, Wine cooler, Safe, Sirius satellite radio, Flatscreen TV with DVD in mid cabin, Macerator with seacock interlock system, Inverter, Foredeck sunshade, Foredeck audio system, Windshield with opening side windows port & stbd, Mesh windshield shade canvas, Electric retractable over cockpit awning, Transom gourmet space w/grill, Cockpit exterior stereo upgrade, Cockpit table teak finish with cover, Hydraulic swim platform, Hydraulic swim platform teak flooring, Rod holders, Transom underwater lighting, US flag, Dynamic running surface, Raymarine ES128 chartplotter/aux display, Open array radar, Raymarine autopilot, Raymarine fish finder, I/B joystick docking system bow & stern thrusters, Windlass - all chain, S/S anchor, Anchor wash down system, Fuel transfer pump, Oil changer system. 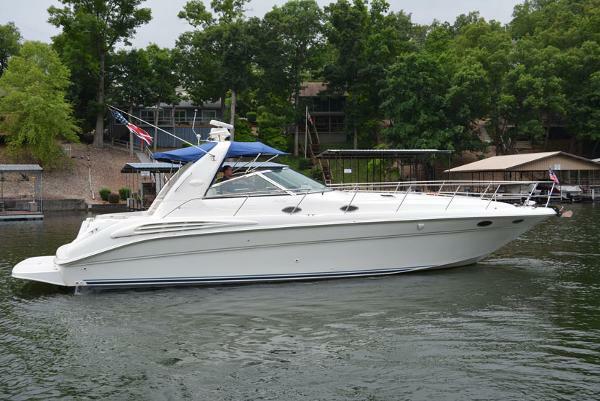 1997 Sea Ray 400 Sundancer REDUCED PRICE Yacth is in Bristol condition. Cared for like a baby. Bottom paint ,hand wax and buff, oil change and tune ...all complete annually. Twin Mercury Bluewater 7.4 MPI engines 2300 hours on engines mostly trolling hours. New canvas and carpet runners throughout newer vinyl in cockpit. Props professionally balanced. Full array RayMarine electronics incl. radar, gps, radio, auto-pilot, ect. Generator ,air, ice maker ,refrigerator ,microwave, coffee maker, vacuflush heads (2), shower premium stereo w/ sub, power windlas, remote spotlight, custom cockpit cover, and many other essential accessories included. This exceptionally maintained beauty won't last long. Make contact to arrange private showing. Serious inquiries only. 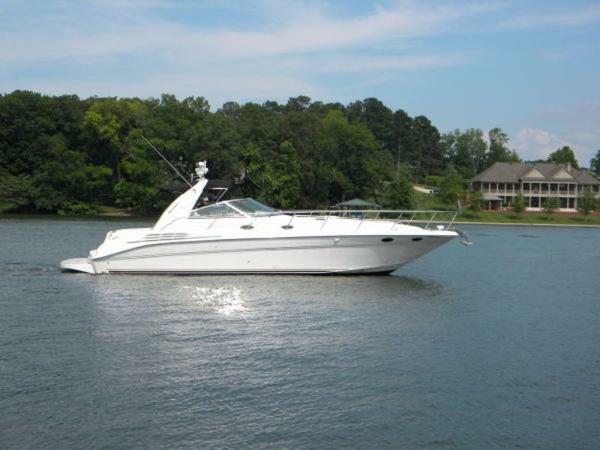 1999 Sea Ray 400 Sundancer Long on styling and loaded with cruising amenities, the Sea Ray 400 Sundancer set the class standards in her day for sportcruiser luxury and elegance. 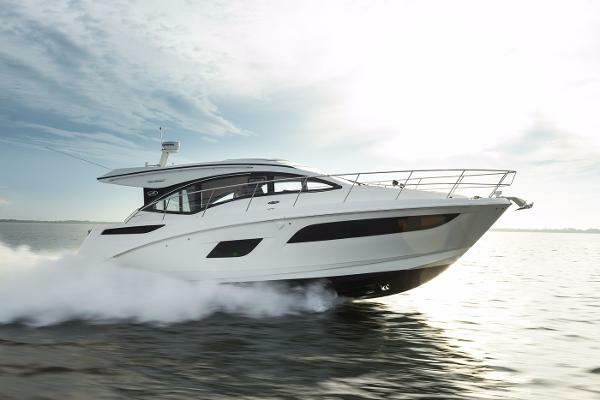 The midcabin floorplan of the 400 Sundancer is arranged in the conventional manner with the owner's stateroom forward, an open galley in the main cabin, and a midcabin stateroom/lounge with a privacy door. One full size head with shower forward and combo head midship. The huge U-Shaped cockpit lounge will seat a small crowd, and the entire aft section of the cockpit sole rises electrically without moving the aft seat for engine access. ALWAYS UNDERCOVER AND IN FRESHWATER. PRISTINE CONDITION. 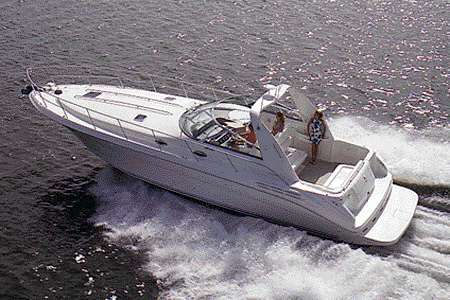 1997 Sea Ray 400 Sundancer Long on styling and loaded with cruising amenities, the Sea Ray 400 Sundancer set the class standards in her day for sportcruiser luxury and elegance. She's built on a deep-V hull with a solid fiberglass bottom, moderate beam, and prop pockets to reduce the shaft angles of her V-drive engines. Always FRESHWATER and under cover. 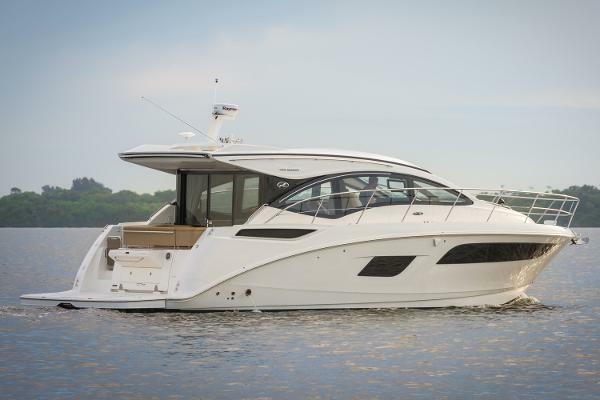 2017 Sea Ray 400 Sundancer Entertainment comes naturally on the 400 Sundancer, with an open floorplan that creates generous, interconnected social zones throughout the boat. Large windows and a convenient sunroof, part of Sea Ray's SkyFlow Design™ philosophy, let in an abundance of natural light. Rich materials and finishes enhance aesthetics as well as comfort, while two full-beam staterooms invite you and your guests to relax, settle in and savor the full experience of life on the water. This beauty is on order. There is still time to customize her to your preferences, but call ASAP if you want it built to your specifications. 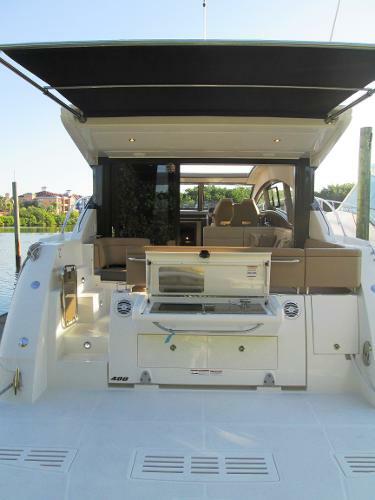 1997 Sea Ray 400 Sundancer Weber Yachts is pleased to bring you this very clean Sea Ray Sundancer. It has been well maintained and just got all NEW ELECTRONICS! 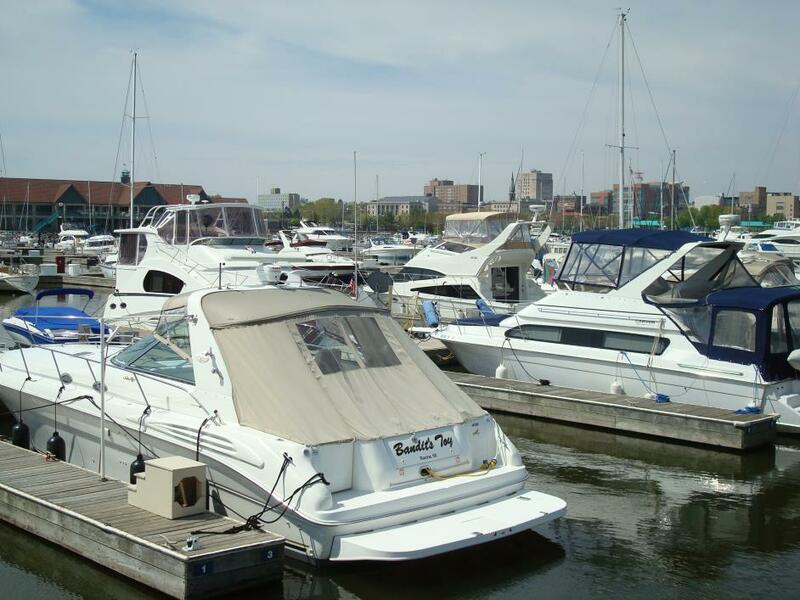 Owner is retiring from boating after years of caring for his vessel. Pictures were done just after it came out of the water, please forgive the quality. If you are in the market for a well maintained 40 footer with diesels, this is one to take a look at. 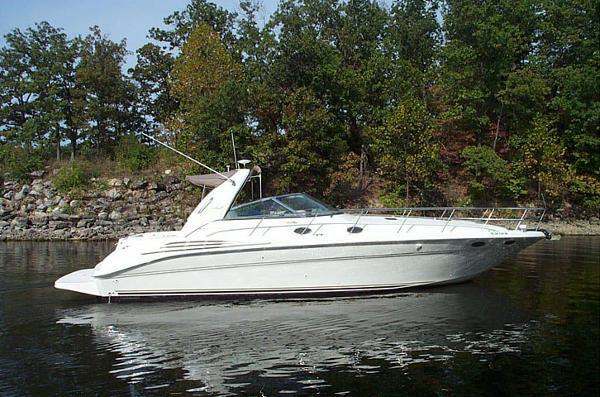 1998 Sea Ray 400 Sundancer 1998 Sea Ray 400 Sundancer This is a real sharp 400DA that has about 1370 hours on 3116TA Cats (350hp). It is equipped with Furuno Radar with B&G Autopilot, Quad Depth Finder, GPS, Garmin 430S GPS, and B&G VHF Radio; Cockpit Carpet and Exterior Canvas replaced Spring 2010; Engines and Generator have had Oil, Filters, and Impellers replaced Spring 2016; Bennett Auto Tabs; Sturdy Engine Synchronizer; Icemaker; Cherry Interior; Diesel Generator; ACR Spotlight; Windlass; Bow Sunpad. Great Price on a nice boat!! 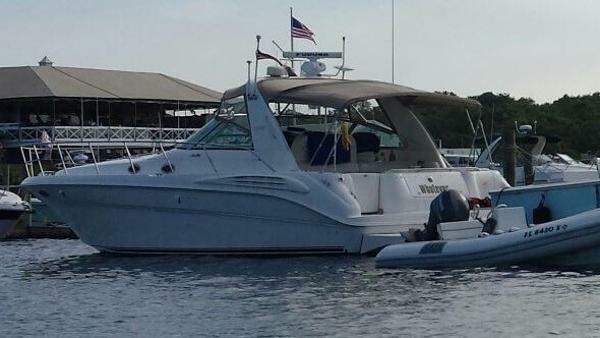 1997 Sea Ray 400 Sundancer 1997 400 Sea Ray Sundancer. Preferred 3116 CAT diesels fully serviced with Approximately 1000hrsThis beauty has Cockpit AC, 2 standup vacu-flush heads and a spacious cabin that can sleep six comfortable.. 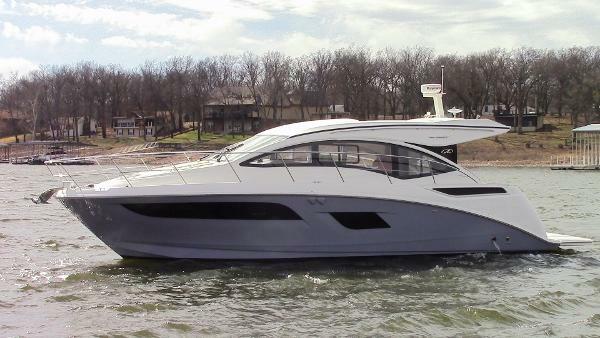 This 400 Dancer is extremely clean, serviced and ready for her new owner. Please call me directly for a showing!